Thank you to Meridian Pacific for the use of their map. Republicans won every race in 2010 within the boundaries of this district and registration shows that 48.9% of voters are Republican and only 25.6% of voters are Democrats. The conservative leaning DTS voters make up around 21.2% of the electorate. This result makes it clear that Corbett has no chance in November. It also doesn’t help that he has not raised enough money to trigger online filing. Harkey on the other hand has over $164,000. 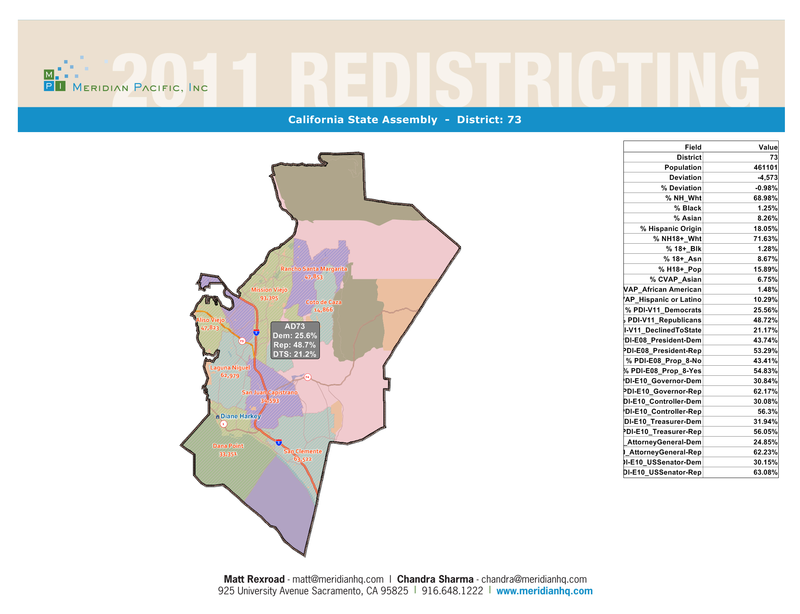 This entry was posted on September 19, 2012 at 11:00 AM	and is filed under 73rd Assembly District. Tagged: Diane Harkey, James Corbett. You can follow any responses to this entry through the RSS 2.0 feed. You can leave a response, or trackback from your own site. Diane Harkey is one of the best Asssembly persons in Sacramento. Every time I call or e-mail Diance to discuss an issue, a bill pending in the legislature or some other public policy matter, Diane not only knows about the matter, she has facts and figures at her finger tips and is leading the conservative Republican charge on the issue on the floor of the Assembly or in Committee. I am very very glad to have Diane as my representative in the Assembly! She deserves to win re-election not only because of her party registration – but because she really works hard for us there and she actually walks the walk as a conservative. OK I am proving that when one goes to fast on a post / comment one can make mistakes – like spelling errors! Here is my comment below without spelling errors. If you want a laugh read the comment above with the spelling errors. Diane Harkey is one of the best Assembly persons in Sacramento. Every time I call or e-mail Diane to discuss an issue, a bill pending in the legislature or some other public policy matter, Diane not only knows about the matter, she has facts and figures at her finger tips and is leading the conservative Republican charge on the issue on the floor of the Assembly or in Committee. I am very very glad to have Diane as my representative in the Assembly! She deserves to win re-election not only because of her party registration – but because she really works hard for us there and she actually walks the walk as a conservative. Chris. How do you spell “slam dunk?” We need help for Chris Norby in the 65th AD. I have just released my Voter Guide of south county cities and statewide Ballot Measures and added Assemblyman Chris Norby’s criticial race in the 65th AD along with Fullerton and Placentia races. They can be seen on my Facebook page. Hah! I have to laugh at all this self-congradulatory, back-slapping stuff of Republican operatives gloating over Harkey’s big campaign stash …as if this was some revelation about South Orange County’s conservative bastion. I happened to have attended Jim Corbett’s talk last night in Dana Point who described himself (he’s a Capo Valley High School teacher) as a “Reagan Democrat”. Maybe one of these loyal Republican “true believers” could attend one of his talks and be, at least, receptive to an intelligent alternative to party power dominance bolstered by big money …unlikely. As for Dianne Harkey, the deep stink of financial scandal in a civil suit isn’t completely covered up by the fleeting perfume of money nor the predictable party endorsements. James Corbett a “Reagan Democrat” – the same James Corbett who is notoriously anti-religion and was sued over his statements in his AP History class. OK Chuck – you drink your Kool Aid and I will drink mine…..I would rather have hard working Diane Harkey as my Assemblywoman in Sacramento than Mr. Corbett and his rants against religion. Mr. Alexander: The case brought against me was the first complaint in 22 years of teaching. It was brought by a boy who admitted under oath that he didn’t do his homework and was based on the “fact” that he was so upset that he simply couldn’t learn in my class and that denied him the opportunity to matriculate at either USC or UCLA. He recorded me in violation of the law, edited the tapes to make it sound actionable, and his free lawyer used the case to raise money for his “Christian” law firm. This is the same “Law Firm” that sued the University of California because that great university wouldn’t accept the “Christian History of the United States” as equal to Advanced Placement United States History (a class I also teach). BTW-that “Christian History” class taught that the US has a special place in God’s plan, which, of course, could be said by Ahmadinejad and every other leader in history who claims a mandate from God. BTW-the pass rate of my students is in the top 10% nationally, although I do agree with Chad, I doubt he would have passed the exam, not doing homework has a consequence. One more thing: You don’t know me. I’m an independent, conservative Reagan Democrat willing to work with both sides to get things done. Harkey has done, literally nothing for the District. When CUSD gets 1000 less per student than the state average and our representation ignores the fact, it’s time for a change.